Straight teeth can improve your smile’s aesthetic and health, but sometimes the thought of traditional braces can keep crooked smiles from seeking orthodontic aid. At Hamilton Family Dentistry, we are proud to offer Invisalign as an alternative to traditional braces for patients with minor misalignment issues. 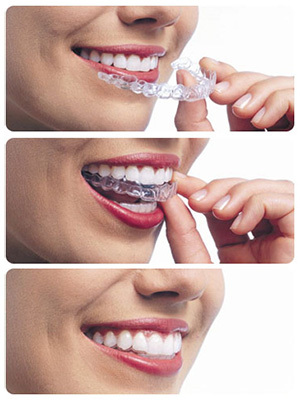 Invisalign is an orthodontic treatment that utilizes clear trays instead of wires or brackets. Each tray is designed to fit your smile perfectly and to gently push each of your teeth into a straighter, more uniform position. Once your teeth have achieved the maximum level of straightness for that aligner, we will switch your aligner so that your teeth can continue progressing. Invisalign makes it very easy to track your orthodontic journey. Clear Braces | Invisalign braces are made with a clear plastic and look virtually invisible against your teeth. You can feel more confident and self-assured throughout your entire orthodontic treatment. Removable Braces | Invisalign invisible braces can be put in and taken out with ease. Patients with Invisalign braces don’t have to worry about food restrictions! You can also remove trays for photos, meetings, or other important events. No special hygiene tasks are required; you can continue to brush and floss normally. Fewer Appointments | Traditional braces require constant trips to your orthodontist. With Invisalign treatment, there are no wires involved and fewer appointments are necessary. Shorter Treatment Time | Invisalign treatment time can vary, but generally, an Invisalign treatment can be completed in a year and a half. Traditional braces treatments can take two years or more. To find out more about our Invisalign braces, call us at our office today. We would be happy to answer any questions you might have, or to schedule an appointment.